any long, cylindrical, flexible structure; called also chord, chorda, and funiculus. spermatic cord the structure extending from the abdominal inguinal ring to the testis, comprising the pampiniform plexus, nerves, ductus deferens, testicular artery, and other vessels. spinal cord see spinal cord. tethered cord a congenital anomaly resulting from defective closure of the neural tube; the conus medullaris is abnormally low and tethered by a short, thickened filum terminale, fibrous bands, intradural lipoma, or some other intradural abnormality. Surgical correction in infancy or early childhood is necessary to prevent progressive neurological deficit in the lower limb and bladder dysfunction. umbilical cord see umbilical cord. vocal c's see vocal cords. (kōrd), [TA] Avoid the misspelling chord. 1. In anatomy, any long ropelike structure, composed of several to many longitudinally oriented fibers, vessels, ducts, or combinations thereof. 2. In histopathology, a line of tumor cells only one cell in width. (kord) any long, cylindrical, flexible structure. genital cord in the embryo, the midline fused caudal part of the two urogenital ridges, each containing a mesonephric and paramesonephric duct. gubernacular cord a portion of the gubernaculum testis or of the round ligament of the uterus that develops in the inguinal crest and adjoining body wall. sexual cords the seminiferous tubules of the early fetus. spinal cord that part of the central nervous system lodged in the vertebral canal, extending from the foramen magnum to the upper part of the lumbar region. 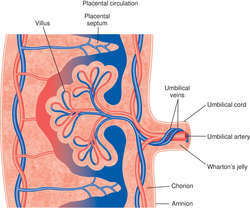 umbilical cord the structure connecting the fetus and placenta, and containing the vessels through which fetal blood passes to and from the placenta. vocal cords folds of mucous membrane in the larynx; the superior pair are called the false vocal cords and the inferior, the true vocal cords. Willis' cords fibrous bands traversing the inferior angle of the superior sagittal sinus. also chord Anatomy A long ropelike structure, such as a nerve or tendon: a spinal cord. any long, rounded, flexible structure. The body contains many different cords, such as the spermatic, vocal, spinal, neural, umbilical, and hepatic cords. Cords serve many different purposes, depending on location, kind of enclosed cells, and body parts or tissue involved. ENT See Fixed vocal cord, Spinal cord, Vocal cord Obstetrics See Umbilical cord. 1. anatomy Any long, ropelike structure. A small, cordlike structure composed of several to many longitudinally oriented fibers, vessels, ducts, or combinations thereof. Synonym(s): fasciculus (2) [TA] , funiculus [TA] , funicle. 2. histopathology A line of tumor cells only one cell in width. 3. A firm, elongated structure consistent with a thrombosed vein, esp. in the extremities, where it may be felt on palpation. The condition in which the umbilical cord is found wrapped around the neck of the fetus during delivery. If the cord cannot be unwrapped easily, or if there is more than one loop, the cord should be clamped and cut before delivery continues. The cord by which the testis is connected to the abdominal inguinal ring. It surrounds the ductus deferens, blood vessels, lymphatics, and nerves supplying the testis and epididymis. These are enclosed in the cremasteric fascia, which forms an investing sheath. The umbilical cord is surgically severed after the birth of the child. To give the infant a better blood supply, the cord should not be cut or tied until the umbilical vessels have ceased pulsating. However, in preterm infants, the cord should be clamped and cut before pulsation ceases to avoid maternal-newborn transfusion and reduce the risk of hypovolemia, polycythemia, and hyperbilirubinemia. The stump of the severed cord atrophies and leaves a depression on the abdomen of the child (the navel, umbilicus, or belly button). In anatomy, any long ropelike structure, composed of several to many longitudinally oriented fibers, vessels, ducts, or combinations thereof. n a long, rounded organ or body. n the central nervous system cord contained in the vertebral column. It is essential to the regulation and administration of various motor, sensory, and autonomic nerve activities of the body. Through its pathways it conducts impulses from the extremities, trunk, and neck to and from the higher centers and to consciousness. It thus provides for simple reflexes, has control over visceral activities, and participates in the conscious activities of the body. any long, cylindrical, flexible structure. the embryonic beginnings in the lateral mesenchyme of the dorsal aortae and aortic arches; at first solid they later become patent. enlargement of the stump of the spermatic cord, common only in pigs and horses, and usually obvious within a few weeks of castration. The swelling may cause lameness, is painful and may be accompanied by systemic signs of fever and toxemia. The lesion is a mass of fibrous tissue interspersed with small abscess cavities and sinus tracts. the structure extending from the abdominal inguinal ring to the testis, comprising the pampiniform plexus, nerves, ductus deferens, cremaster muscle, vaginal tunics, testicular artery and other vessels. the structure connecting the fetus and placenta, and containing the channels through which fetal blood passes to and from the placenta. Q. How can I fix my vocal cords? Please I am in need of desperate help. A. Well this basically means there is a very small narrowing of the cervical (your neck area) spinal canal (where the spinal cord is), however the narrowing does not cause any damage to the spinal cord, therefore probably does not cause any major symptoms involving the nerves. The c4-5 bulging part refers to the part in between the two cervical vertebras c4 and c5, in which the disc (a part in the spinal cord) is sliding a bit side-ways, but again, it does not seem to be causing any trouble. But that is far into the future, so be wary of some private blood banks-where storing your child's umbilical cord blood will cost you an arm and a leg-that make false promises. Length and thickness of the umbilical cord were measured using measuring tape and Vernier calipers. The most recent wave of data also shows that 60% of Cord Nevers said they are "very satisfied" with their current TV access situation, compared to 50% of Cord Cutters. Introduction of Patch Cord Industry: Along with Brief Introduction of Patch Cord Industry it includes Development of Patch Cord Industry and Status of Patch Cord Industry. In addition to the VERICOM standard straight molded boot on each end of our standard patch cords, VERICOM offers patch cords with 90 degree connectors. Lock cords into position whenever horizontal blinds or shades are lowered, including when they come to rest on a windowsill. Both research groups found that cord blood, with its small number of stem cells, was slower than marrow to develop into a full complement of blood cells. She says: ``I think cord is always popular because it's hard wearing,comfortable and a great alternative to denim. In addition, the purchase price of a 2-meter cord was recorded to see if performance had any correlation to cost. Most cord blood banks are for-profit companies charging annual fees to parents. LIFEBLOOD BANKING UMBILICAL CORD STEM CELLS FOR TREATMENT OF DISEASES SEEMS LIKE GOOD INSURANCE - BUT DOES THE POLICY REALLY PAY OFF? There are lots of full cord skirts and little cord jackets around. If the pull cords are threaded through the plugs, cut them off close to the plug.